Legendary Compton hip-hop Singer/Rapper and mixtape pioneer. Passed away in 2005 in a motorcycle accident. Mixmaster Spade sang fun-filled verses and rhymes about the reality of the Compton streets. He started making mixtapes in 1983. Made his debut with Compton rap pioneer, Toddy Tee. Introduced Mixmaster Spade & The Compton Posse. 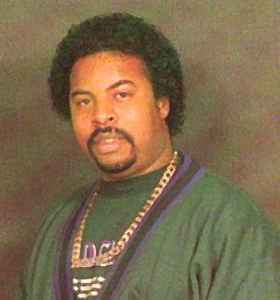 Spade was very close friends with DJ Pooh, Joe Cooley, CJ Mac, DJ Var, and Low Profile's DJ Aladdin. Houston rapper Jazzie Redd also wrote some of Spade's rhymes. Spade spoke of the many biters of his sound on "Genius is Back". His nursery style rhyme was often imitated by local acts also making mixtapes, stealing Spade's choruses, rhymes, and cadences. He was the first "homeboy" singing on hip hop tracks from the West Coast. He paved the way for his predecessors and proteges, such as NWA, Snoop Dogg, DJ Crazy Toones, Nate Dogg, and DJ Quik. DJ Quik speaks on the Legend of Mixmaster Spade on his DVD "DJ Quik: Visualism". Spade's trademark was two words he said often, "Aw Yeah!". He can be seen in King Tee's "Ruff Rhyme" music video. And also pictured on the album cover for King Tee's "Act a Fool". In 2008, Gents of Desire and Union Clothing Store in Los Angeles, presented a MIXMASTER SPADE billboard atop the Union Clothing store building. Mixmaster Spade can also be heard on "The Game (It's Ruff)" and "Baggin on Moms" by King Tee, "Do You Wanna Go to the Liquor Store" by King Tee from the St. Ides Commercials Produced by DJ Pooh, and tribute song for Mixmaster Spade called "Sure Shot" by DJ Quik.